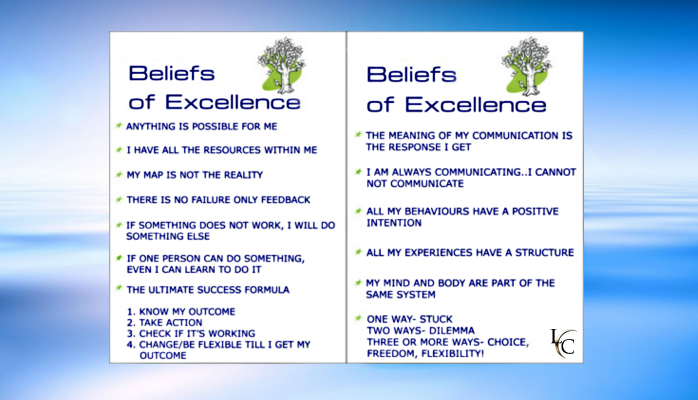 NLP Presuppositions form the basic beliefs and attitudes that effective NLP Practitioners work and live by. The 14 presuppositions below are the central principles of NLP. They form a set of ethical principles for life. People represent the world internally to create their own personal and subjective realities. We respond mainly to our internal experience (map of reality), not to the external reality itself. How we represent things in our mind are our interpretations. Interpretations may or may not be accurate. In any case, these interpretations determine how we experience each moment, and therefore lay the foundation for our experience of reality in the future too. Having choices about how to interpret your reality now, changes your experience of it. And having more choices available to you begins by choosing to interpret each experience in a way that frees your thinking to explore different points of view. So, how else can you look at your situation, and how else, and how else?… In this way your map of reality expands. We could sum it as “we respect each other”. Just because someone else has a different point of view (map of reality), it doesn’t mean that they are wrong or you are right. By aiming to increase choice, you’re choosing expand your map of reality. Expand your map to one that gives you the widest and richest number of choices. The more choices you have, the freer you are and the more influence you have over yourself and others.
. Associated to self. In your body, looking at the situation from your point of view.
. Associated to other. Taking the other person’s frame of reference.
. Associated to the “observer” or “witness”. Taking the meta or objective perspective. Being the “fly on the wall”. Familiarizing yourself with being in all 3 perceptual positions and becoming comfortable doing so in all contexts broadens your scope of choice. With practice one can assume multiple perceptual positions simultaneously. With that comes the freedom to more consciously choose your thoughts, feelings and actions in all types of situations. A person always makes the best choice they can, given their map of reality at the time. The choice may be self-defeating, bizarre or evil, but for them, it seems the best way forward. Give them a better choice in their map of reality and they will take it. Even better – help them upgrade their map to one with more choices in it. Another way of putting this is: We all act according to the level of awareness that’s available to us in that moment. The reason why people regret certain past actions is because they have greater awareness now, and because of this phenomenon, they eventually overcome their current regret too. Based on the premise of this presupposition, whoever caused us pain in the past, did so based on their level of awareness at that time. They were trying to fulfill a certain value in their old map of reality and never knew how else to go about it back then. Looking back on that past hurt from a broader and resourceful perspective in the present can enable healing and release of stuck emotions. No one is wrong or broken. People function perfectly even if what they are doing is ruining their life. All behavior has a structure. When you understand the structure, you can change the behavior into something more desirable. People carry out their behavioral strategies perfectly, but the strategies may be poorly designed and ineffective. Finding out how you or others do what you or they do, enables you or them to change the ineffective strategy to one that is more suited to achieving useful and desirable results. Behind each behavior there is a positive intention. This may be the anticipation of pleasure or avoidance of pain. People want to achieve something that they value and which benefits them. NLP separates the intention or purpose behind an action from the action itself. A person is not their behavior. When a person has a better choice of behavior that also achieves their positive intention, they will take it. When the behavior is undesired, find alternate ways to achieve the behavior’s positive intent. Seek to add choices and resources. When you take away choices, other compensating behaviors can occur. Internal conflicts, indecision, procrastination and lack of motivation are often the result of conflicting values in our unconscious awareness. Establishing the highest intention or purpose of each conflicting value enables integration and inner alignment that results in greater choice and freedom. To change unwanted behaviors, start by eliciting the highest positive intention that drives that behavior, and then seek to satisfy that intention through more appropriate means. In order to be more understanding and compassionate towards others, seek to establish what their highest positive intentions are. We act according you our current level of awareness. By bringing the underlying purpose of particular actions into awareness, we create more possibilities for our clients and ourselves. Resistance in others indicates a lack of rapport, or that the other person doesn’t get your meaning. We all resist when we don’t understand. Your intended communication is not always what is perceived. You cannot not communicate. We are always communicating either verbally or non-verbally. Even the absence of a response is information. Each person deletes, distorts and generalizes pure sensory information (input through the senses). Our nervous system is conditioned to filter information in this way. These filters are triggered by both verbal and non-verbal behaviors in others. Which is more important: What you intend to communicate, or what you actually communicate? Flexible communicators change what they’re saying (and how they’re saying it, as well as their body language) until their desired results are obtained. You already have it in you. Everything a person needs to effect a positive change is already in them. They may, however, not be consciously aware of it. Often people have resources that they haven’t considered or are available in other contexts. Resources mean the internal responses and external behaviors needed to get desired results. Our most basic resource is our ability to learn. There are no unresourceful people, only unresourceful states of mind. As response-able people, we can run our own mind and therefore move toward getting the results that we want. The key to achieving this is through knowing how to change your state, as specific resources are accessed only through being in the appropriate state. States are the keys that either open or lock the door to the infinite reservoir of resources inside you. Appropriate states are those that match the kind of resources that you would like to gain access to. For example, to be in a confident state shift your bodies posture, breath and internal dialogue to that which matches confidence. You will immediately begin to feel more confident. In the above way you can, through changing you body posture, breath and internal dialogue, assume any state. Through assuming appropriate states, your thinking becomes clear, new creative choices arise into awareness, and empowered actions are the result. Conversely, we’ve all had the experience of being in a miserable state, and you know how resourceful you felt then! The hypnotic state is highly versatile state, since it’s often referred to as the “master key” to your inner resources. Hypnosis enables people to have direct contact with the level of their awareness that’s usually unconscious. Hypnotherapy leverages the hypnotic state for the purpose of healing. So, whichever way you choose to go about it, states are the way in which you tap your inner wisdom and productive levels of thought to deal effectively with any situation. 9. Mind and Body are connected, and form a system. It’s clear how the mind-and-body affect each other: Prolonged stress or heavy emotional spells often result in physical sickness. Likewise, positive attitudes, joy and laughter are not only healing for the body, but also help prevent sickness. NLP eye patterns reveal our internal sensory processing. Some of the other physiological cues that indicate our mental processes are posture, speech and breathing rate. Since physiological cues reflect the functioning of your mind, by changing particular physiological cues you can affect the functioning of your mind. For example, slumping in your chair can make you feel tired, or taking a walk can uplift your thoughts. Treating only mental/emotional or physical symptoms without taking responsibility for the underlying reasons why such symptoms have manifested, may disrupt the mind/body system. Ignoring the subtle causes of unwanted symptoms can result in more complex complications later. For example, regularly taking sleeping tablets to get enough sleep at night, without addressing the mental/emotional causes (like stress or dissatisfaction) of not being able to sleep, may lead to burn out and/or disease. Consciousness expresses itself through the system of your mind and body. Mind and body are therefore intimately linked, and ultimately, they’re two aspects of the same source. Any healing program must aim to optimize the flow and balance of consciousness in both the mind and body in order for healing to be effective and complete. Legend has it that prior to Thomas Edison inventing the light bulb, he was interrogated by a probing journalist who demanded to know why Edison had failed something like 200 times to invent the light bulb that Edison claimed was an imminent reality. Edison´s reply went along the lines that he hadn’t failed to invent the light bulb 200 times, instead, he’d discovered 200 ways not to invent it. With that kind of attitude, Edison was quite likely able to maintain a resourceful state and be positively motivated to persevere until his goal was reached. The attitude that we bring to a situation determines our response to that situation. Every result gives you feedback, maybe information about how to do something differently next time. Feedback is helpful and sets direction. This kind of attitude toward “failure” produces results that allow you to improve. Results are the means by which you measure your progress and adjust your behavior in order to achieve your desired outcomes. Every experience offers a positive learning, one from which we can grow intellectually or in terms of emotional intelligence. Living is learning, even if you loose, you don’t loose the learning. This is the Law of requisite variety from systems theory. It means the person with the most options and behavioral choices will control the system. In any field, the top people in that field are those who have the most variety in their behavior. They have choices of behavior that their colleagues don’t. Any time you limit your behavioral choices you give others the competitive edge. If you’re able to respond to any situation in a variety of ways, you are more likely to get your outcome. No matter how you define success, many successful people have got to where they are through modeling the successful performance of others. Modeling is not copying. Copying how someone became successful in the 80s is unlikely going to make you successful today. Modeling in NLP is the process of identifying and replicating both the conscious and unconscious competence in another, which results in that person’s excellence. Unconscious competence (what we do effortlessly, without conscious awareness) can be identified through careful observation, questioning and strategy elicitation. Once you know the thoughts, beliefs, values and behaviors that result in excellence, you can test the model and refine it to fit with you. Once you’re able to replicate the same degree of success in a specific context, you’ve got that model. If it’s possible for someone else, it’s possible for you, and teachable to others (provided they don’t have severe physiological or neurological damage). In this way most people can learn to get better results in their own way, you do not become a clone of the model – you learn from them. Find a model of excellence in a field that you’re interested in. Identify the sequence of components (thoughts, beliefs, values and behaviors) that are necessary to achieve the desired result. Apply that model in a way that enables you to get the same kinds of results, and success is yours. Many of our personal issues and challenges in life are the result of parts of our unconscious mind becoming dissociated from the flow of neural information that’s available to our whole Self. This essentially leads to the formation of sub-personalities in our unconscious awareness, each one essentially with its own values system. All unwanted behaviors that we have little or no conscious control over are driven by parts. Conflicting parts are also the cause of indecision and procrastination. Integrating parts is therefore an important part of most coaching and therapy sessions. In NLP, a variety of methods have been developed to integrate parts, including finding new solutions for a parts using the Six Step Reframing technique, and creating oneness between two or more parts using the Parts Integration or Visual Squash technique. Real learning is in the doing. Through application you will soon discover what works and what doesn’t work. Keep doing (and refining) the things that get you the results that you want. Remember, there is no failure, only feedback.